After 40 years of experience and passion in the auto repair business, Officina Meccanica Salvia Mario launches the Parts4trucks website. Parts4trucks is the result of our continuous success and emphasises the sense of modernization and innovation of our company. We only supply original equipment and we have a complete selection of truck parts for a wide range of makes and models – offered at the lowest price. If the truck part you require is not available online, then please feel free to contact us for a no obligation price and availability check. 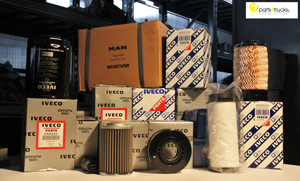 Parts supplied worldwide with a rapid delivery guaranteed.